NOTE FROM DearMYRTLE: The following was received from our friends at The National Archives (UK) . Please address all inquiries to The National Archives, Kew, Richmond, Surrey, TW9 4DU through their contact us page. 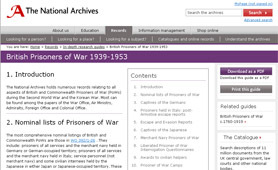 The National Archives' in-depth research guides are getting a new 'look and feel' and extra functionality to make them easier to use. The in-depth research guides are intended for experienced researchers who need detailed information on how to find and understand records relating to particular subjects. They cover a huge range of subjects, reflecting the vast and unique collection held by The National Archives. The in-depth guides complement the shorter research signposts, which are intended for users beginning their research. Researchers should also note that the guides will no longer appear as results of searches specifically within the Catalogue, but they will continue to appear as results of searches of the whole website. Work is continuing to update and improve the content of the guides themselves, to make them more suitable for the needs of experienced researchers. As part of this, a number of guides on similar subjects have been merged, and a small number have been archived. The new-look guides will be launched on Monday 18 October.